Mollie Doctrow and Lee Dunkel will show their work in “Natural Rhythms, Interlacing Forms: Florida Landscapes” at the Alice & William Jenkins gallery through May 26. 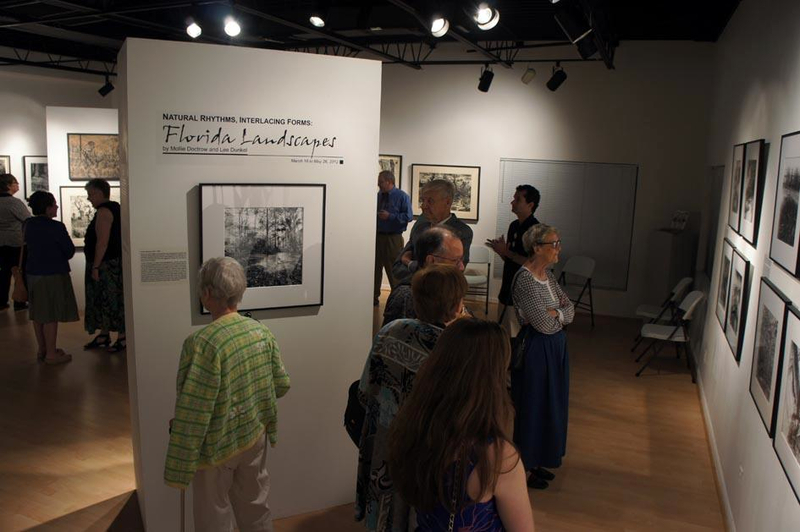 The gallery room at Crealdé School of Art showed richness, depth and energy through displays of unique local Florida landscapes. Mollie Doctrow and Lee Dunkel have been working for years on capturing the subtle rhythms of Florida’s rich subtropical environment usually overlooked by residents. Both artists displayed individual perspectives of Florida that they say are found in our backyard; one only needs to look for it. Doctrow specializes in black and white woodcut prints. Woodcut is a primitive style of art that includes physically carving out the design into a sheet of wood using various sharpened tools. Doctrow notes the organic connection that comes from working on the wood as well as being in nature while drawing the beginning sketches. The medium of wood forces the artist to make the picture flat, yet overall works toward an amount of depth, Doctrow said. On an average landscape, Doctrow needs to work six uninterrupted hours a day for two weeks before the carving is ready to be printed. When looking for inspiration, Doctrow goes on walks without a plan for any particular scene. Not forcing the art is an element she stresses. “I go out on a walk and sketch, hoping to find that initial spark that says, ‘Stop and pay attention,’” Doctrow said. Doctrow’s newest project involves the Wildflower Wayside Shrine Trail, a self-guided walking trail that explores pristine scrubland on the South Florida Community College Highlands Campus. She conceived the trail from her exploration of the natural world and from the indigenous shrine boxes she encountered while studying the culture of India. The shrine boxes are representations of endangered plant species found on the Lake Wales Ridge. The amount of awareness created by the sketches fostered two organizations to set aside a portion of this dwindling ecosystem for environmental preservation and education. Dunkel’s medium for her art is photography. She focuses on black-and-white because of the abstract quality it lends to the image, she said. Working in the darkroom is what sets Dunkel apart from many photographers. In the age of digital photography she attributes working in the darkroom, and not in front of a computer, to her restlessness and the unique feeling she experiences while creating her photos. To find the right shots for a portfolio of the St. Johns River, Dunkel anchored her boat and sank her tripod into the water to leave the camera sitting only an inch above the surface at times. The contrast of Dunkel’s black-and-white landscapes have an outstanding reality to some. Mary and Robert Morales drove from Jacksonville to attend the exhibit and workshop on Saturday. Mary’s hobby is carving linoleum and then printing to paper, which is similar to Doctrow’s style of woodcarving. Her husband has a growing interest in photography, so the event was perfect for both. “This event gave us inspiration to go out and find things then go back to our studio; him working on his photography and me working on my sketches.” Mary said. The event was curated by Rick Lang, director of photography at the Crealdé School of Art. Lang has been curating at the galleries on site for 22 years. When hanging an exhibit, Lang looks at the flow of the pictures along with what the viewer will see when first walking through the door. The viewer needs to be able to see the work easily while walking around and not be bombarded, Lang said. These two artists convey the beauty of Florida’s unique landscape. Through the dynamic contrast of Dunkel’s black-and-white photographs and Doctrow’s organic and physical woodcuts, Florida’s landscape becomes art all residents can enjoy.